THE ATLAS MOTOR FOCUSSER IS OUT OF STOCK AND WILL NOT BE PRODUCED AGAIN. SPARES AND ACCESORIES ARE AVAILABLE OF COURSE. PLEASE SEND AN EMAIL TO ME IF YOU NEED HELP. How often have you been irritated about unsharp stars? How often have you ever wanted an automatic focus? The ATLAS Motor focusser is used for upgrading existing manual focusers for astrophotography with CCD cameras, SLR cameras, or webcams, so for all applications where it is on an accurate and repeatable focusing of the camera. With the purchase of a ATLAS Motor focusser any anger about a missed focus is a matter of past! 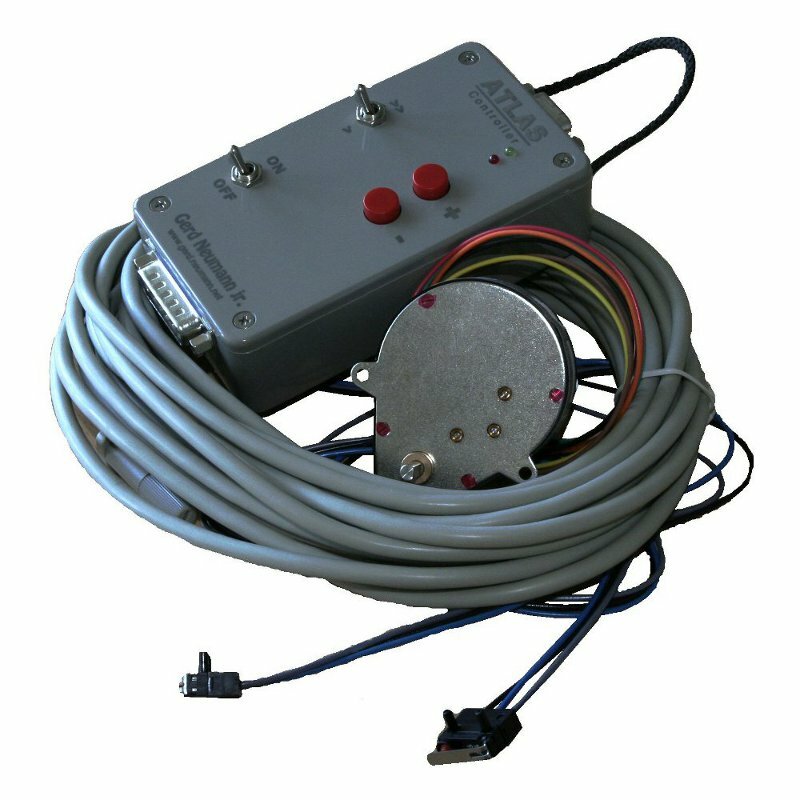 The ATLAS Motor focusser consists of the stepper motor, gearbox transmission, the controller and the required connection cables: Controller <> engine and a serial port cable with built-in power supply. (All components are available separately on request.) There is also a version with two limit-switches available. The ATLAS Motor focusser can hold even the heaviest cameras and accessories: It is connected via a gearbox with a maximum torque of XXNm and a very high quality clutch with the shaft of your focuser. The used clutch shaft between the gearbox and the shaft of the focuser can compensate for both linear and angular error and radial error, so the installation of the ATLAS Motor focusser especially easy. The ATLAS Motor focusser can be retrofitted to almost all existing manual focusers. The universal mounting bracket is pre-drilled for focussers from Vixen, GSO, Orion and also suitable for many others. (When ordering please specify the instrument and focusser, where the ATLAS will be used, since the clutch must be modified. Optional (also subsequently) the ATLAS can be equipped with two limit switches. These should be fitted to your instrument in such a way, that the travel of the motor/drawtube is limited by the switch, and not by mechanical stops. The ATLAS can be used without limit-switches, since mounting the limit switches is usually quite difficult and expensive. Most ATLAS units are bought without limit switches. Focusing is done either by the computer via the built-in serial interface (USB via converter) or manually via the buttons on the hand controller. For controlling the ATLAS via the computer, the controller supports the widespread RoboFocus protocol, whereby the full ASCOM (www.ascom.org) compatibility is ensured. The ATLAS is easyly controlled from all major ccd-controll programs. 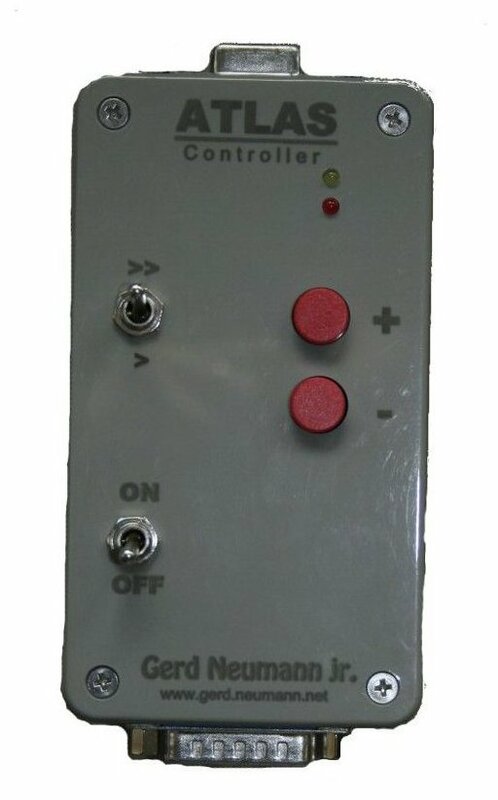 For manual operation, the controller has two buttons move the motor/drawtube. A additional toggle is used to selected speed. The controller has an input for a temperature sensor, which is available optional. All parameters of the controller (operation with / without limit, speeds, step sizes, backlash compensation, etc) can easily be modified and stored via the computer with the supplied program "ATLAS Focus Server". There is no cryptic programming via buttons and DIP switches needed. With the purchase of a ATLAS Motor focusser any anger about a missed focus is a matter of the past!